The first settlers in the Coosa River Valley were the Creek Indians whose later encounters with the Spanish and French had a significant influence on the history of Sylacauga. Events that occurred between these three groups were partly responsible for the settlement in 1748 by Shawnee Indians of the village of Chalakagay. Sylacauga was first mentioned in Fernando DeSoto's records in 1540. It was later listed in the French territorial records in 1759 as being a town inhabited by 50 Shawnee Indian Warriors, and the name then known as Chalakagay. Late in the summer of 1836 all of the Indians remaining in Alabama were taken west by the United States Government. The name Sy-la-cau-ga is made up of two Indian words "Chalaka-ge" which means, "The place of the Chalaka Tribe". 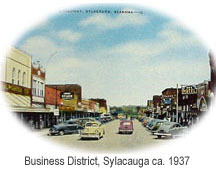 The city was first incorporated in 1838 as Syllacoga and again in 1887 as Sylacauga. Several important roads traversed this section as early as the 1830s. Numerous ferries were put across the rivers. In 1852, a plank road was built from Montgomery, Alabama to Winterboro, Alabama passing through Sylacauga. The first railroad through Sylacauga was the Anniston and Atlantic Railroad on December 1, 1886. In 1838, the first Sylacauga Post Office was established with George Washington Stone, later Chief Justice Stone of Alabama, as Post Master. The first newspaper, the Sylacauga Argus made its appearance in 1887. The paper was printed and edited in Calera by H.G. McCall. 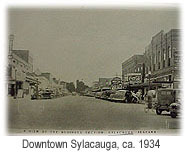 Sylacauga's main thoroughfare is Broadway Avenue. The first building on this street was built in 1890 by the Smith Brothers. Sylacauga, "The Marble City", is constructed on a solid deposit of the hardest, whitest marble in the world. The bed is approximately 32 miles long by one and one half miles wide and 400 feet deep. Some of the most beautiful buildings in the country, such as the United States Supreme Court, the Al Jolson Shrine in California, the Woolworth building in Houston, Texas and many others have been constructed and ornamented with Sylacauga marble. Sylacauga, Alabama is located slightly to the east of the geographical center of the State of Alabama in Talladega County. The city is roughly 51 miles southeast of Birmingham, 63 miles north of Montgomery, and 40 miles southwest of Anniston, Alabama.